The Gold Coast Suns have experienced some turbulent years in their short history, but 2018 was perhaps the nadir. 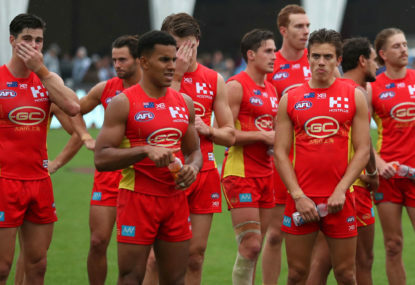 Under a new coach in Stuart Dew, the club’s third head coach since they joined the AFL in 2011, the Suns had to put up with not only some awful on-field performances but also the constant speculation that co-captains Tom Lynch and Steven May would be leaving to further their careers at opposition clubs at the conclusion of the season. Gold Coast won just four matches in 2018, which seems endlessly worse when you consider three of those wins came in the opening five rounds of the season. 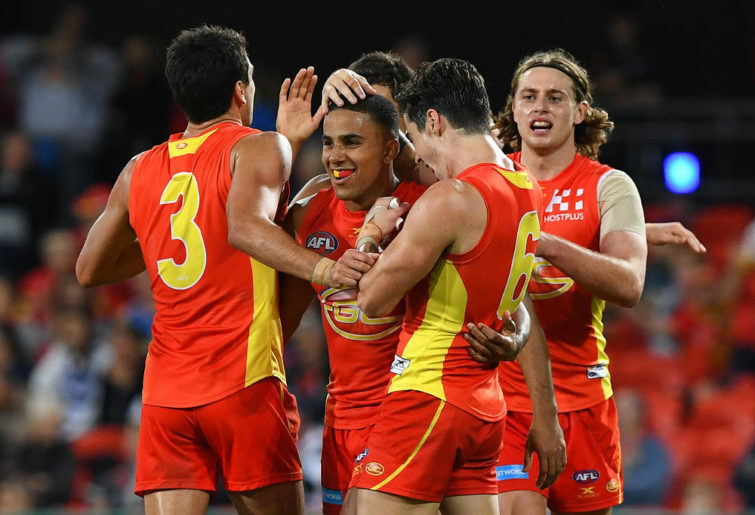 Following their Round 5 win over the Brisbane Lions that had the Suns just percentage off a top-four spot – albeit a lot of percentage – they went on to lose 11 matches in a row by an average margin of 48 points. Granted, they did provide one of the biggest upsets in the modern era, defeating the Sydney Swans at the SCG by 24 points in Round 18, but it was one of very few highlights in a dark year, which ended with 17th position ahead of Carlton. Inaugural Gold Coast defender Jarrod Harbrow claimed his first best and fairest award after a strong year, beating out Touk Miller and new recruit Lachie Weller. The list turnover at the Suns continued in earnest following the season, with 207-gamer Matt Rosa announcing his retirement. Former Docker Michael Barlow was delisted, as were youngsters Josh Jaska, Mackenzie Willis, Max Spencer and former first-round draft pick Jesse Lonergan. Brad Scheer, Jack Leslie, Harrison Wigg and Michael Rischitelli were all axed with the promise of being redrafted as rookies. Shockingly, after a top-six finish in Gold Coast’s best and fairest in 2017, the Suns delisted ball-winning midfielder Jarryd Lyons, who was instantly signed by the Brisbane Lions. With Gold Coast and Carlton’s struggles down at the bottom of the ladder over the past few seasons, the AFL stepped in and allowed both clubs the ability to preselect a predetermined number of mature-age stars from the state leagues around Australia, with these players also able to be used during the trade period. The Suns were afforded three players, selecting Werribee pair Josh Corbett and Sam Collins and plucking Chris Burgess from West Adelaide in the SANFL. No-one in the footy world was surprised when four-time leading goalkicker and All Australian Tom Lynch announced his intentions to return home to Victoria to continue his career. Lynch was stripped of his co-captaincy duties in the lead-up to his signing with Richmond as a free agent. In a separate trade with the Tigers, Gold Coast were able to secure fringe midfielders Anthony Miles and Corey Ellis, but the exodus continued. Aaron Hall was traded to North Melbourne for a late pick, while Jack Scrimshaw, selection seven in the 2016 draft, was sent to Hawthorn after just four games. Steven May, who had assumed sole captaincy following Lynch’s decision, also left the club, landing at Melbourne along with fellow defender Kade Kolodjashnij in exchange for pick six. Out-of-favour Port Adelaide defender Jack Hombsch joined the Suns, as did former Cats George Horlin-Smith and Jordan Murdoch, the latter joining as a delisted free agent. Armed with picks two, three and six, the Suns had perhaps the strongest hand at the national draft. With their opening two selections Gold Coast opted for South Australian duo Jack Lukosius and Izak Rankine before taking Victorian tall Ben King at selection six. Eyeing off another SANFL prospect, the Suns traded up to Pick 23 to grab Jez McLennan before Gold Coast academy player Caleb Graham officially joined the playing list via selection 71. Livewire forward Darcy Macpherson also officially became a senior-listed player after three years as a rookie. 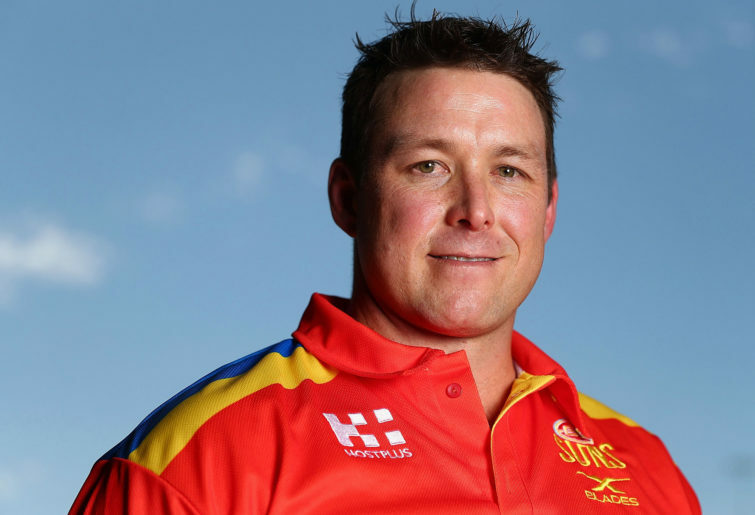 The gutting of the Gold Coast list over the off-season has left Stuart Dew with very little star power to play with, but what he does have is a glut of dependable and dedicated players, one of them being David Swallow. The inaugural No.1 draft selection for the Suns back in 2010, Swallow played 20 matches in 2018, averaging 22 possessions, 4.5 tackles and 3.8 clearances. The 26-year-old is a model citizen and, at the time of writing, looks likely to be the next captain of the club. With the loss of Tom Lynch, the Suns now have a gaping hole in what was already an underperforming forward line. For Peter Wright and Sam Day, it is time to step up. After a breakout 2017 season in which he kicked 31 goals, Wright had a disappointing year, managing just seven games as he battled injury and form. ‘Two-metre Peter’ must become the focal point up forward for the Suns in 2019, and how he copes with getting the No.1 defender each week will go a long way towards how many times Gold Coast can kick a winning score. Just getting back to senior footy was a major win for Day, who suffered a horrific dislocation of the hip in last year’s JLT Series. The 26-year-old’s return to the line-up was cut short in Round 14, suffering a shoulder injury against Hawthorn. 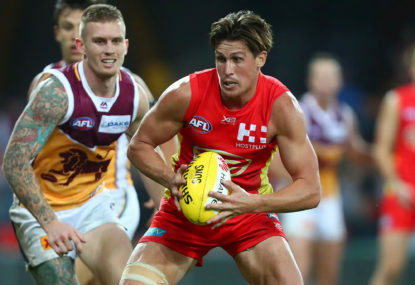 One of the most experienced inaugural Gold Coast players on the list, Day must form a partnership with his younger counterpart Wright to give the Suns some bite up forward. Jack Bowes, the first Queenslander drafted inside the top ten since David Armitage in 2006, experienced a sharp rise in form late in his second season with the Gold Coast Suns. Despite suffering a 74-point loss to reigning premiers Richmond in Round 21, Bowes produced a career-best performance, collecting 26 disposals and taking ten marks. He continued to be one of his side’s best players in their final two games of the year, which will hold him in good stead as he enters 2019. Bowes can play either inside or outside midfield, while he can also be used in defence, where his running capabilities and neat disposal can have an impact. Things haven’t quite panned out as well as expected for Pearce Hanley since his defection from the Brisbane Lions to the Suns in 2016. Coming off an incredibly challenging 2017 season in which he had to deal with his brother passing away, a foot injury that sidelined him for five games and then a broken hand suffered in the International Rules Series. Things didn’t get much better this year, with the Irishman dislocating his shoulder in his first match of the year in Round 3 against Fremantle. He made his return in Round 20, but a hamstring strain a week later ended his season. Out-of-contract at the end of 2019, Hanley will be hoping for much better luck on the injury front, otherwise the 30-year-old could find the Suns running out of patience with him. Seeking more opportunities after just six games in two seasons with Richmond, Anthony Miles looks set to give the Gold Coast midfield a much harder edge. Coming off a superb year in which he was a joint winner of the JJ Liston Trophy in the VFL, expect Miles to slot straight into Gold Coast’s centre square rotations alongside David Swallow and Touk Miller. 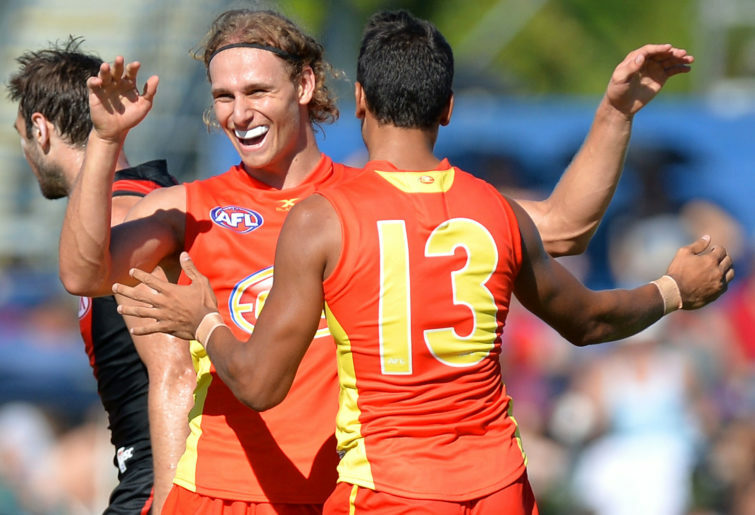 It’s a similar story for Jack Hombsch, who joins the Suns after stints with Port Adelaide and Greater Western Sydney. After being a mainstay in the Power defence in his first two years at the club, he has managed just 37 games out of the last three seasons. While not a star defender by any means, he will plug a considerable gap left in the Gold Coast backline following Steven May’s departure. Werribee star Sam Collins will also be itching to make the most of his second chance at AFL level following 14 games at Fremantle. Collins has attacked preseason with vigour and possesses a massive frame, so he will give the Suns defence some much-needed strength. There is genuine excitement at Carrara with the arrival of Gold Coast’s latest batch of draft selections. With their three top-six selections the Suns opted for South Australian pair Jack Lukosius and Izak Rankine and Victorian tall Ben King. Lukosius is a hard-running power forward with a beautiful kicking action, very much in the Nick Riewoldt mould. Expect him to get plenty of games in his debut season. Rankine is as mercurial as they come. With genuine X factor, he will bring fans through the gates at Metricon Stadium and looms as a fan favourite. King spent most of his junior football as an agile key defender but is more than capable of swinging forward. At 200 centimetres, he will require a bit of time, but he should still expect to play a lot of senior footy in 2019. There is perhaps nothing more important in the world of Supercoach than having two high-scoring ruckmen. Some opt for two out-and-out stars, such as Max Gawn and Brodie Grundy, whereas others will go with one star and one slightly cheaper option so that they can afford a premium player in another position. That cheaper option in 2019 is Jarrod Witts. The No.1 ruck for Gold Coast averaged a healthy 88.6 points in 2018 and was very durable, playing every game. It was slightly down on his average from last year, showing that he has scope for improvement. One to keep an eye on. After spending much of this year on the road due to the unavailability of Metricon Stadium with the Commonwealth Games, the Suns will be pleased with a much more travel-friendly fixture for the 2019 season. Their first 11 rounds are tough, however, with two trips to the Adelaide Oval and Marvel Stadium, along with games at Optus Stadium and Sydney Showground Stadium. Following their Round 14 bye the Suns head back to scene of their unbelievable upset win over the Swans last season, and they make three more trips to Melbourne along with an away clash to state rival Brisbane. Gold Coast will play their customary two matches against the Lions in 2019, and they also face fellow cellar dwellers St Kilda and Carlton twice. Double-up matches against Adelaide and the GWS Giants will test Stuart Dew’s men. History will be made in Round 13 when the Suns play the first-ever AFL match for premiership points in Townsville against St Kilda. As a result of hosting a match at Riverway Stadium, Gold Coast won’t play a game in Cairns in 2019, making it the first season in their existence that they won’t head to Far North Queensland. After two consecutive years of facing Port Adelaide in China, the Suns won’t return overseas – they’ll be replaced by the Saints. In Round 3 the Suns will play the Western Bulldogs at Marvel Stadium, making it their first meeting with the Bulldogs at that venue since their very first clash back in 2011. Gold Coast will also face Hawthorn under the roof in Round 22, which will be the first-ever time the two sides have met at Docklands. 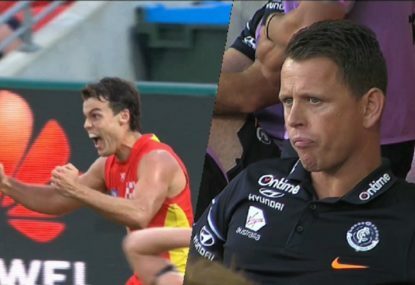 The rivalry between the Gold Coast Suns and Brisbane Lions reached new heights in 2018 following the on-field antics of Brisbane skipper Dayne Zorko and Suns tagger Touk Miller. 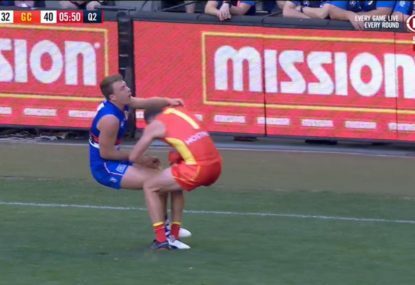 Both players were involved in heated altercations during both meetings this year, with Zorko refusing to shake Miller’s hand after the Suns hung on to win a thriller in Round 5. In their return meeting in Round 22 Zorko and Miller engaged in a small push and shove surrounded by teammates following the siren. In the lead-up to that match Lions’ midfielder Nick Robertson publicly labelled the Suns ‘soft’. Gold Coast have the hosting rights in Round 6, when they face the Lions at Metricon Stadium, which will be the first-ever time the Q-Clash has been played during the afternoon. The Suns will then get another crack at the big brother in Round 21, which will be played at the Gabba. Expect plenty of fire in both encounters. The Suns are yet to beat just one other club in their eight-year existence, and they get an early opportunity to break that duck when they face the Crows at Adelaide Oval in Round 5. The Gold Coast have lost all their 11 matches against Adelaide by an average of 56 points. Their record at the Adelaide Oval isn’t too flash either, with four losses from four attempts by an average of ten goals. Gold Coast fans might want to consider weeding the garden this round. Suns offer star draftees mega contract extensions. Gold Coast are in for a world of hurt in season 2019, there is no other way of saying it. The loss of Tom Lynch and Steven May, not only their key pillars at either end of the field but their co-captains, will damage on-field results severely. The likes of Anthony Miles, George Horlin-Smith, Sam Collins, Josh Corbett and Sam Burgess will ensure the club doesn’t get bashed around every week. From all reports, the younger players are making great progress on the training track, and Stuart Dew has some great coaching philosophies in place, even going as far as losing a considerable amount of weight during the off-season to set the example for his squad. 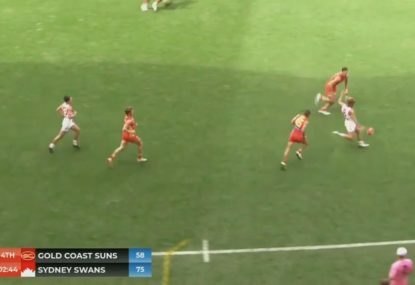 For Dew, the main focus should be limiting the number of times the Suns fade out of matches, as we saw all too often after half-time in 2018. Will they better the four wins they achieved this year? Time will tell but I have my doubts. Predicted finish: 16th to 18th.